FAYETTEVILLE, Ark. — Arkansas will host both No. 11 Ole Miss and No. 24 Mississippi State at George M. Billingsley Tennis Center this weekend. The No. 46 Razorbacks will play the Rebels on Friday at 5 p.m. CST, while Sunday’s match against the Bulldogs is set for 1 p.m. CST. Fans can follow both matches via live scoring at RazorbackStats.com. Admission is free. All matches will feature complimentary pizza, Keurig products, popcorn and Pepsi soft drinks for all fans in attendance. The Hogs topped the Rebels 4-0 last year in Oxford, Mississippi, but fell 4-1 to Mississippi State in Starkville. Arkansas owns a 14-13 advantage over Mississippi State in the all-time series but is 12-25 against Ole Miss. • Ranked No. 40 nationally, Tatum Rice and Ana Oparenovic lead the SEC with an 11-1 record at No. 1 doubles. • Giulia Pairone is one of nine singles players in the SEC with at least nine wins and one or fewer losses. • The Hogs have won the doubles point in 12 of 14 matches this spring. • Winners of six straight, Pairone and Mia Jurasic have also been dominant in doubles at 10-2 this spring. 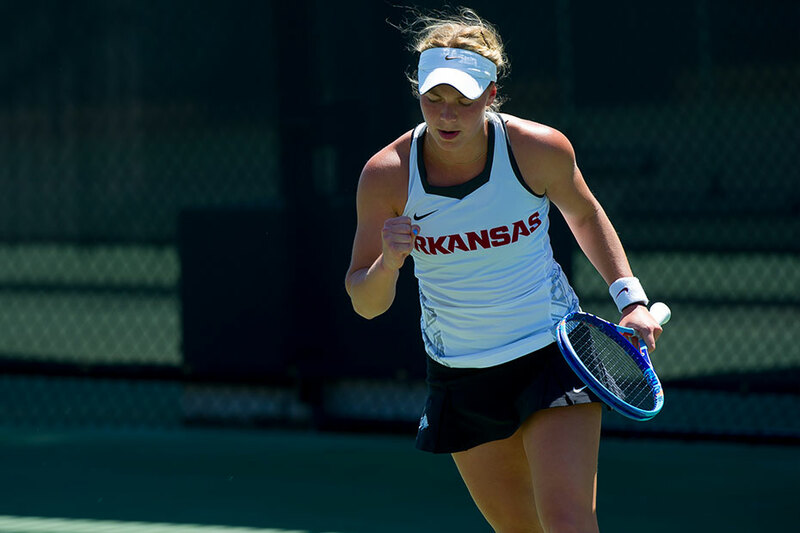 • As a team, Arkansas has combined to win 27 of its 39 doubles matches this spring, good for a .711 winning percentage.